Dr. Post and the Center for Health have some of the best training, as well as over 30 years experience in successfully treating literally hundreds of cases of neck and back pain, headaches, disc injuries, etc... associated with auto accidents. Dr Post is an experienced expert witness and has testified successfully in court many times for his patients in documenting the injuries and losses they have sustained. 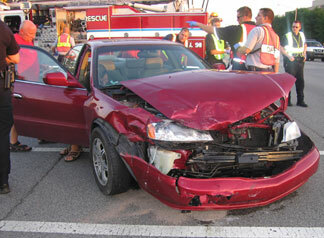 Dr. Post has an excellent relationship with many of the best personal injury attorneys in the state. Dr. Post and the Center for Health will send your bills either to your insurance company or your attorney whenever possible so there are no out-of-pocket expenses, which often add insult to injury. Your Greatest Loss May Occur After The Accident! When one automobile is struck by another, thousands of pounds of force are exerted on the neck and spine of the passengers. The head, which is very heavy compared to the neck, is thrust toward the hitting vehicle. The muscles then stretch and react with a violent spasm in the opposite direction. The painful result is injury to the muscles, ligaments, nerves, and, on occasion, even broken bones. Many accident victims experience neck pain, back pain, headaches, or other symptoms at the time of the accident, while some experience these symptoms several hours to days later. Surprisingly, sometimes it takes several weeks for the pain and symptoms associated with an accident to present themselves. This is why an accident victim isn't necessarily 'alright' just because he or she doesn't have any broken bones or immediate pain. Also, it is important to note that, even if you've been to an emergency room after an accident and were released with no broken bones, you still can have serious delayed 'soft tissue' symptoms that require treatment. It is for this reason that it is always important after an accident to get examined by a doctor who specializes in these types of injuries. At the Center For Health, Dr. Post has over 25 years of experience treating patients that have been injured in motor vehicle accidents. Also, and importantly, Dr. Post is an experienced Expert Witness who has successfully testified for his patients in court many times over the years. Chiropractic is the specialty of choice to evaluate accident victims for soft tissue (muscles, tendons, ligaments, and discs) injuries associated with these accidents. Often chiropractic treatment is necessary to realign the bones of the spine and restore integrity to the ligaments, muscles and joints. When a bone is broken it heals with bone and becomes stronger than before. Soft tissue however, heals as scar tissue which is weaker and less resistant than before. And, just like a bruised apple, it never returns to its original state! While long term healing from these injuries can take time, treatment often can provide rapid relief from the immediate symptoms associated with these injuries.